After a quick trip to J&R last Sunday we decided to chance the impeding thunderstorms and walk through Chinatown for some food. 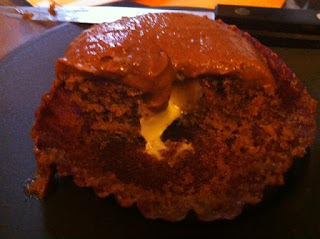 Mr. T had dumplings on his mind but I had something quite different planned- cupcakes! After picking up a bag of frozen dumplings across the street we trekked upstairs to Everything Frosted and ended up with an array of sweet treats. 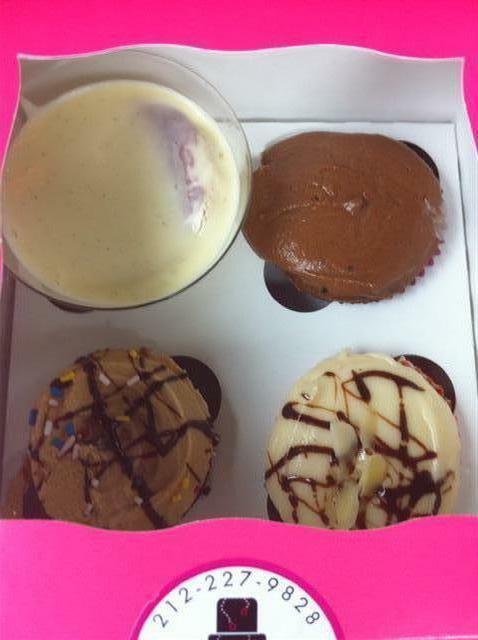 From the top left clockwise- White Chocolate Strawberry pudding, Coffee Mocha cupcake with Chocolate Frosting, Yellow cake with Almond Butter Cream frosting and a Banana cake with Peanut Butter frosting. The White Chocolate pudding was Mr. T’s choice and it was velvety smooth and incredibly light. Along with the fresh strawberries inside was a bit of angel food cake. Of the three cupcakes the Coffee Mocha cake was by far my favorite. The coffee flavor was very pronounced in the cake and then you hit the center jackpot. Extra mocha frosting oozing out! Yum!! The other two cupcakes were a little disappointing, The banana cake was almost identical to a breakfast muffin and lacked the light texture of the coffee cupcake. The Almond cake was good but just not as good as the Mocha. However the frosting on both were fantastic. Next time I would get the peanut butter frosting on a different cake. So we got our sweets, stopped for a Bubble Tea, picked up take out from NY Noodletown and grabbed a cab just as the sky opened up and it started pouring. I think that is a successful Sunday in the city. Sweet Treats Week at Nyctastes!